Deal creation is a three step process in Belong comprised of creating Locations, creating Content, and finally creating Campaigns. 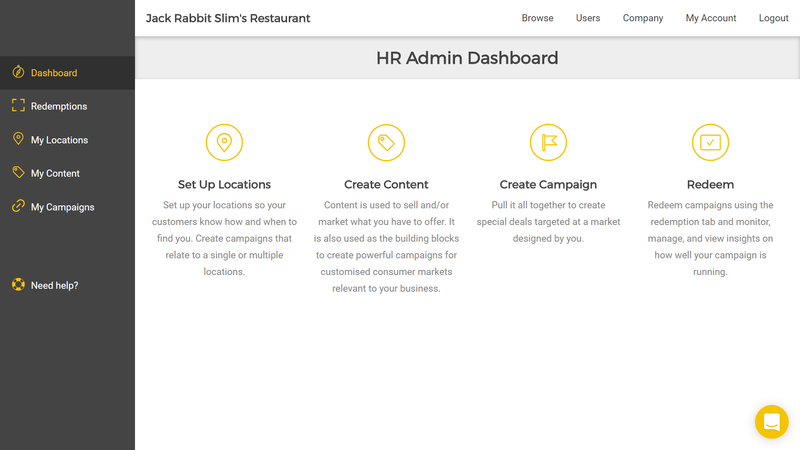 This allows you to template most of the deal creation process, so in the future it will be faster and easier to create more great deals. The first step to creating a new deal is creating the locations that your deal can be redeemed at. Locations can be both physical and virtual and will appear at the bottom of each deal. Go to the My Locations menu and click "add new". Here you will be asked to enter the name and address (if applicable) of your location. If an address is set, then the location will be shown on a google map under each deal. The opening hours and the associated contact details can also be added, you can enter the website address of your online store for example. If this is your main store/point of contact it is a good idea to set this as your default location. Content is best described as the product or service that the deal is on, the idea is that you can reuse the same content on different deals. To create a new content piece, go to the My Content menu and click "add new". 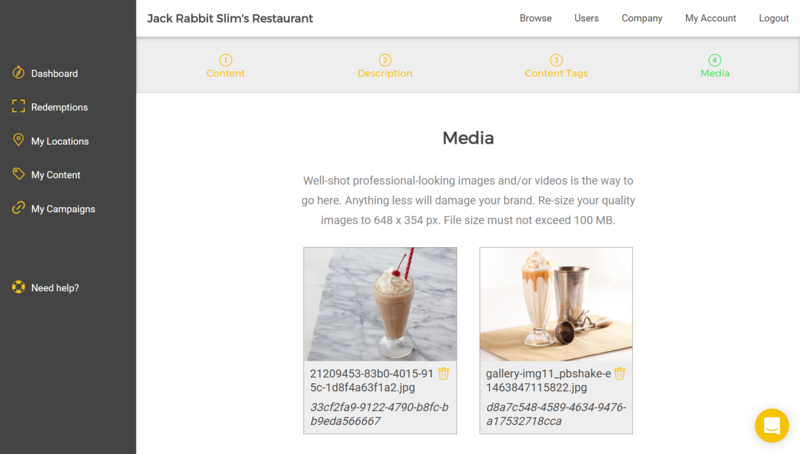 You can name the piece of content, give it a short description and upload images. Images will look best when they are 750px x 450px (or a 5x3 aspect ratio). 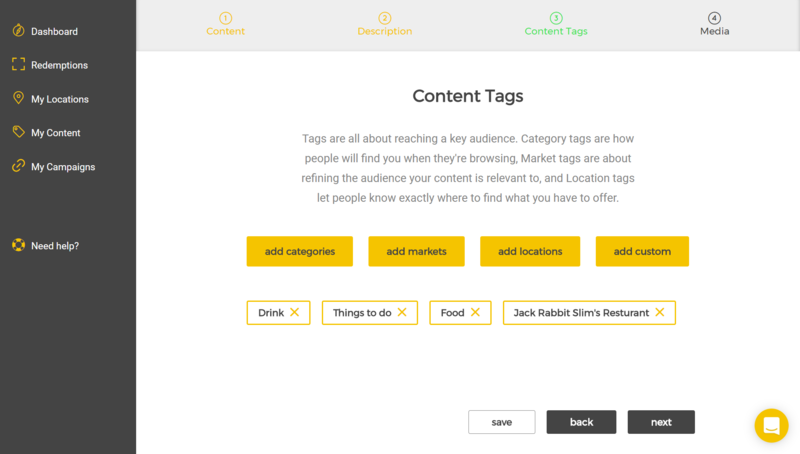 You also have the opportunity to add various tags to the content. In particular you should add category tags so members in Belong can find your deal when they filter the deal list. 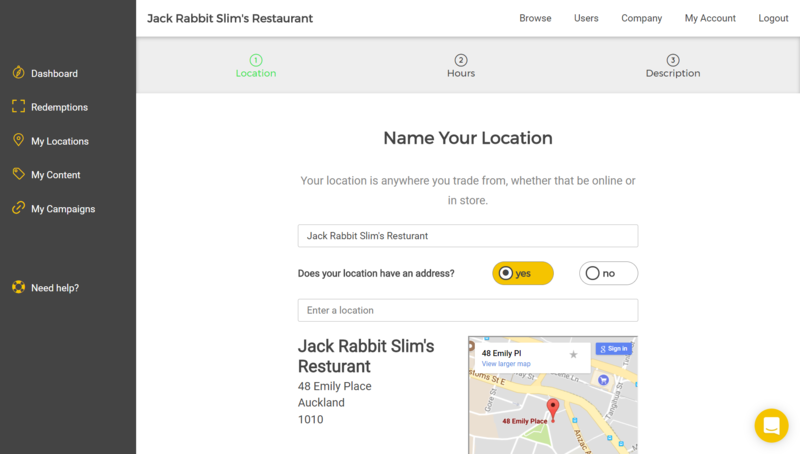 You should also attach your location to your deal by using the location tag. 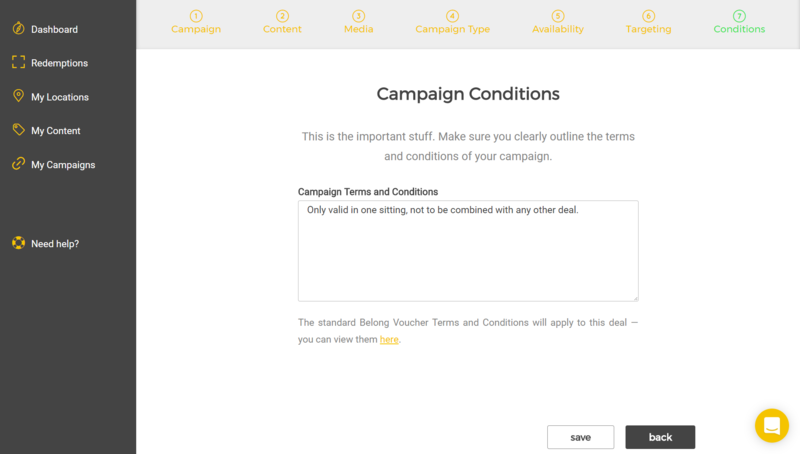 Campaigns are the final step of the deal creation process in Belong. Campaigns are where you take the locations and content you have created previously and then combine them all and apply the various discounts and redemption methods. Campaigns in particular, contain the pricing information associated with a deal. To create a new campaign, go to the My Campaigns menu and click "add new". Firstly enter a campaign name. 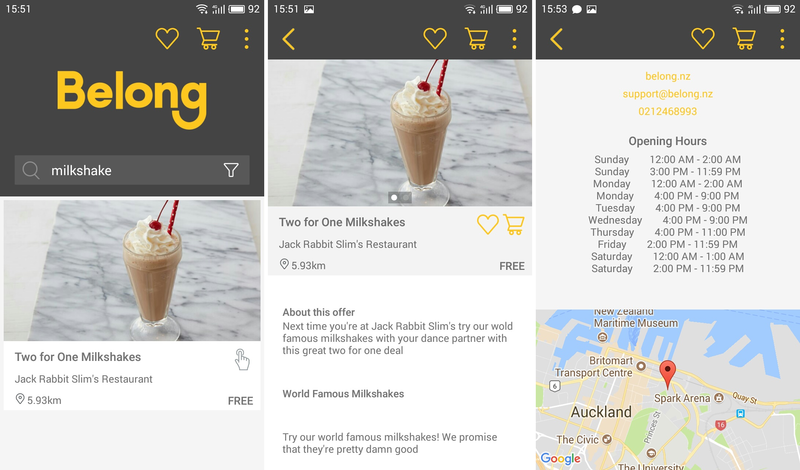 The campaign name is the headline title that will be displayed on the deals page, it should be short and effective at capturing the attention of Belong members. The campaign description is a short description about the campaign, try to communicate what the unique selling points are and why this campaign is special. 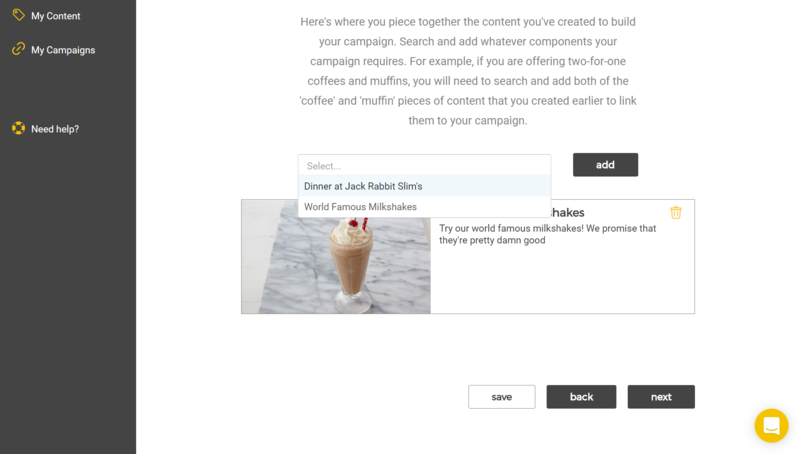 In the next step, select what content you want to add to the campaign and then click "add". 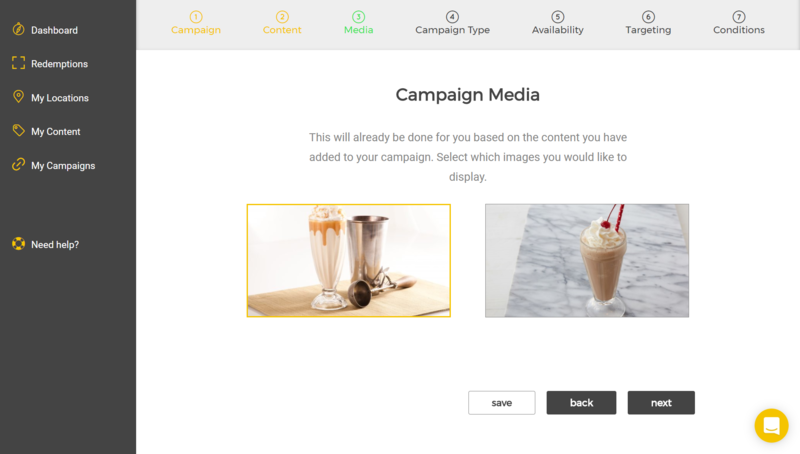 You can then select what images you want to show on the campaign. Selected images will be highlighted by a yellow border. To add more images you will need to alter the content piece. Coupon: A form of discount voucher that is free to claim and the member will make the purchase directly from you. All payment will be made with you during redemption at the point of sale. Marketing Campaign: A campaign that is not transnational and generates no voucher. Marketing campaigns are best for advertising to the Belong community and allow you to set a call to action. 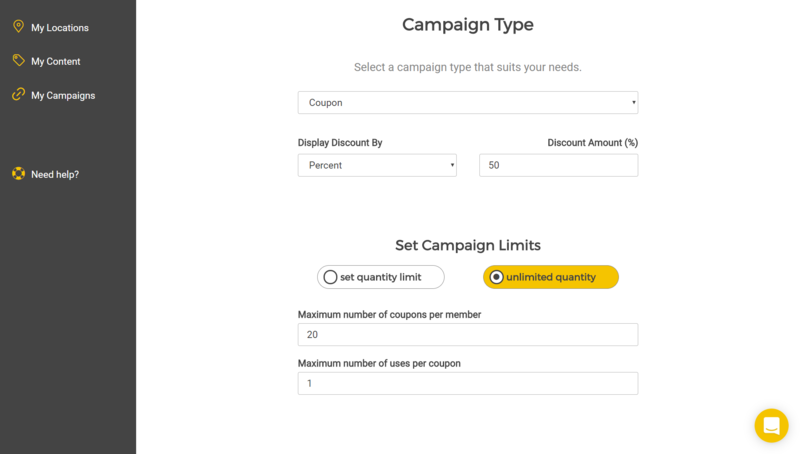 If the campaign type is "Coupon" then you can enter the discount amount, and choose whether to display the discount as a percentage or fixed monetary amount. 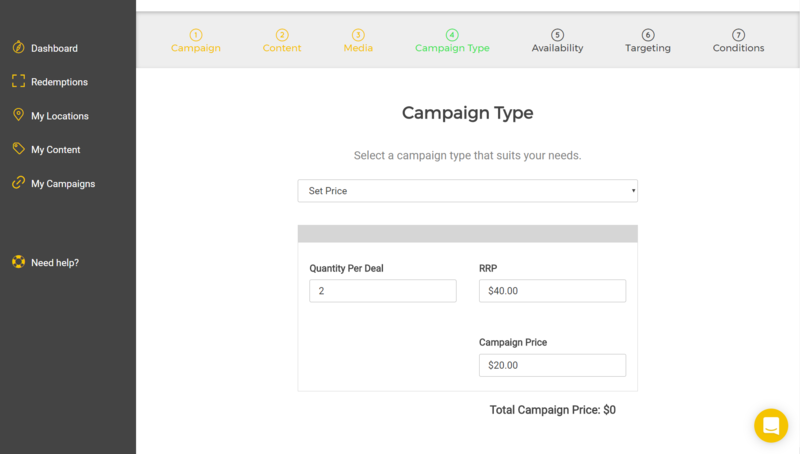 If the campaign type is "Set Price" then you should enter the quantity of content pieces provided in the deal (eg "2 for 1" means two content pieces), the RRP of each content piece, and the discounted campaign price. At the bottom you will see the "Total Campaign Price", the amount that each member will pay when purchasing this deal. 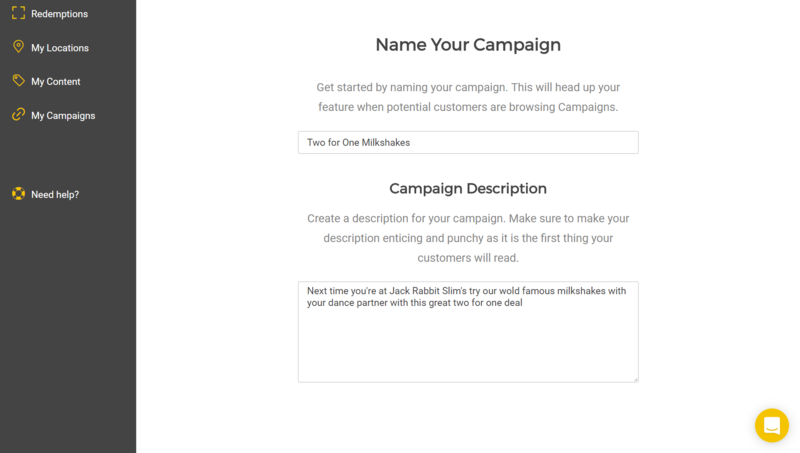 The third campaign type is "Marketing Campaign", where you can select what kind of call to action you want. There are three types of call to action; website link, email address, or phone number. Once selected, you can enter the address in the field below. 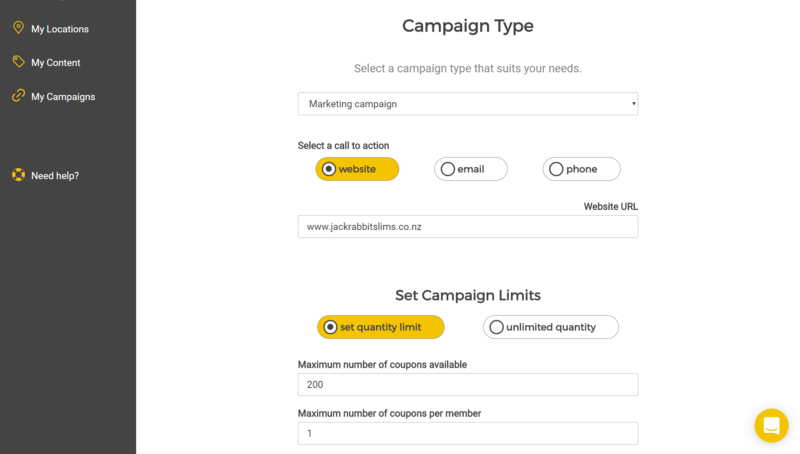 For all types of campaigns you will need to set campaign limits and availability, for example if the deal has a limited number of vouchers available. You can also set a maximum number of vouchers that each member can download. The "Maximum number of uses per coupon" allows you to create a campaign that can be redeemed multiple times, for example a loyalty card that allows you to buy 10 coffees for $30. 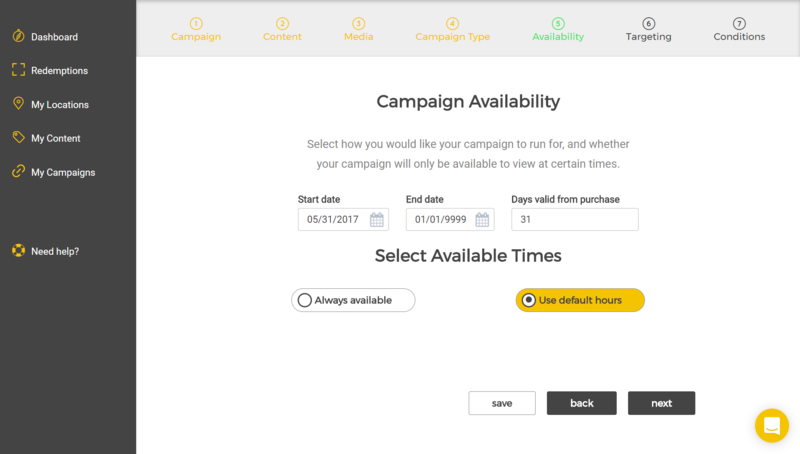 The Campaign Availability menu allows you to set how long the deal will be visible to Belong members. The deal is only visible on the start date, once visible members can start claiming vouchers for this deal. The end date is the date the campaign is no longer visible. From this date on, the employee can no longer download any more vouchers for this deal. They can still redeem existing vouchers that have been downloaded and printed (as long as the voucher has not expired). You can also enter a voucher expiry period, for how many days after purchase a voucher is valid for. 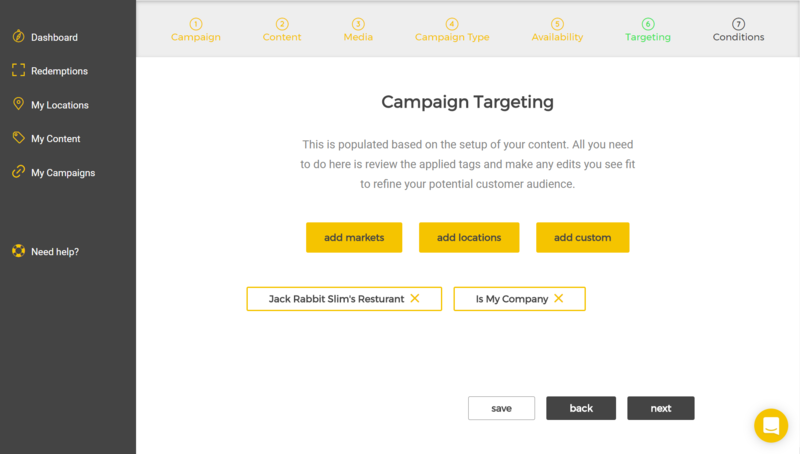 Next you can target your campaign to certain markets by adding tags. This means the deal will only be shown to Belong members who meet a certain demographic. For example, if you only want to offer the deal to members of your company you can select the "is my company" tag. Then make sure you select the locations you want your deal available at and any custom tags you may require. Finally add clear and detailed terms and conditions to your deal. This is very important as you don’t want to risk making your first experience with your new customer a bad one. Limit your liability by adding information such as "not in conjunction with any other offers". Anything missing? Double check you've entered and saved all your details. Now you need to publish it, go back to the campaigns menu and click on tick icon. You should see the colour of the campaign status change to green. Once a campaign has been published, it will go the the Belong team for approval. After approval, it will be live for the Belong community! 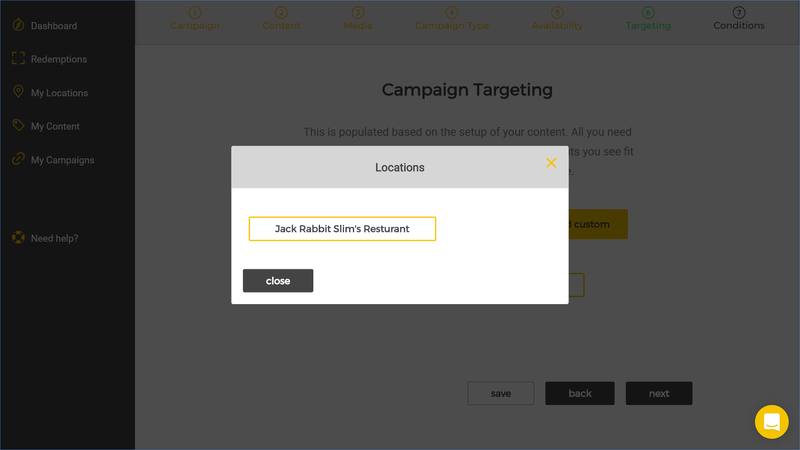 Make sure you have added the tag for the location on the campaign targeting step. 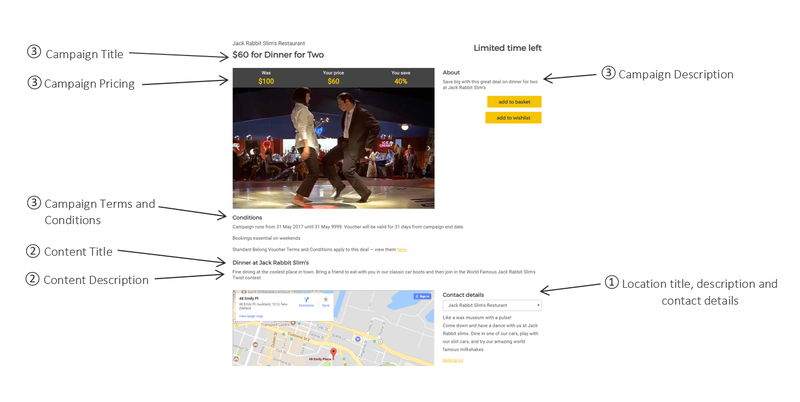 Click the "add locations" box and check that the locations you want the deal available at are highlighted in yellow.